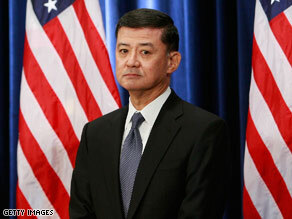 Retired U.S. General Eric K. Shinseki, the new Veterans Affairs secretary, said he will work reduce the six-month delays in paying veterans’ disability claims, and he wants to move quickly toward an all-electronic claims system that could accelerate the process. In a recent testimony to Congress, Shinseki said the VA is looking at a major switch that would phase out paper processing, possibly by 2012. In the meantime, the VA will hire 1,100 more staff this year to deal with the backlog of cases. “This is a brute-force solution,” Shinseki told the House Veterans Affairs Committee, adding that a technological format is needed “to ensure timely, accurate consistent decision-making on behalf of our veterans. Shinseki also said he was launching a topdown review of his embattled department and reiterated his promise to submit a “credible and adequate 2010 budget request” that will be cost-effective while fully sensitive to veterans in need.